A linear stability analysis of a pressure driven, incompressible, fully developed laminar Poiseuille flow of immiscible two-fluids of stratified viscosity and density in a horizontal channel bounded by a porous bottom supported by a rigid wall, with anisotropic and inhomogeneous permeability, and a rigid top is examined. The generalized Darcy model is used to describe the flow in the porous medium with the Beavers-Joseph condition at the liquid-porous interface. The formulation is within the framework of modified Orr-Sommerfeld analysis, and the resulting coupled eigenvalue problem is numerically solved using a spectral collocation method. A detailed parametric study has revealed the different active and coexisting unstable modes : porous mode (manifests as a minimum in the neutral boundary in the long wave regime), interface mode (triggered by viscosity-stratification across the liquid-liquid interface), fluid layer mode [existing in moderate or $O(1)$ wave numbers], and shear mode at high Reynolds numbers. As a result, there is not only competition for dominance among the modes but also coalescence of the modes in some parameter regimes. In this study, the features of instability due to two-dimensional disturbances of porous and interface modes in isodense fluids are explored. The stability features are highly influenced by the directional and spatial variations in permeability for different depth ratios of the porous medium, permeability and ratio of thickness of the fluid layers, and viscosity-stratification. The two layer flow in a rigid channel which is stable to long waves when a highly viscous fluid occupies a thicker lower layer can become unstable at higher permeability (porous mode) to long waves in a channel with a homogeneous and isotropic/anisotropic porous bottom and a rigid top. The critical Reynolds number for the dominant unstable mode exhibits a nonmonotonic behaviour with respect to depth ratio. However, it increases with an increase in anisotropy parameter ξ indicating its stabilizing role. 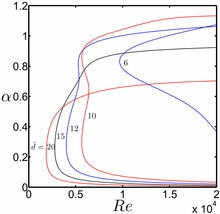 Switching of dominance of modes which arises due to variations in inhomogeneity of the porous medium is dependent on the permeability and the depth ratio. Inhomogeneity arising due to an increase in vertical variations in permeability renders short wave modes to become more unstable by enlarging the unstable region. This is in contrast to the anisotropic modulations causing stabilization by both increasing the critical Reynolds number and shrinking the unstable region. A decrease in viscosity-stratification of isodense fluids makes the configuration hosting a less viscous fluid in a thinner lower layer adjacent to a homogeneous, isotropic porous bottom to be more unstable than the one hosting a highly viscous fluid in a thicker lower layer. An increase in relative volumetric flow rate results in switching the dominant mode from the interface to fluid layer mode. It is evident from the results that it is possible to exercise more control on the stability characteristics of a two-fluid system overlying a porous medium in a confined channel by manipulating the various parameters governing the flow configurations. This feature can be effectively exploited in relevant applications by enhancing/suppressing instability where it is desirable/undesirable.